This decadent Caramel Macchiato Cheesecake is a treat you don’t want to miss! A Caramel Macchiato drink turned into the best cheesecake recipe ever. It’s National Cheesecake Day…. AKA the best day ever! Being a self-proclaimed food junkie, of course I have to celebrate and I joined up with 65 other food bloggers to all post a different cheesecake recipe on our sites today. How cool is that?! I am ashamed to say that this is only the SECOND cheesecake I have ever made in my entire life. I always just found them daunting (I find most cakes daunting for some reason). It could be because the last cheesecake I made was about 3 years ago and the water from the water bath leaked into the cheesecake and made the crust all kinds of soggy. This one, however, came out perfect. 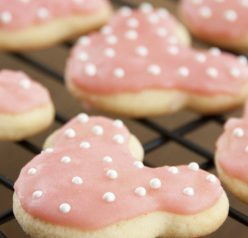 I was shocked – nothing ever comes out perfectly for me the first time I make it! Especially not cakes of any kind. This cheesecake was so creamy, velvety and dense, just like a cheesecake is supposed to be. The coffee taste was very subtle and not overpowering. One of my favorite drinks from Starbucks is the caramel macchiato. I was pretty much obsessed with them when I lived down in Miami and walked by a Starbucks every single day and found myself wandering in there far too often. 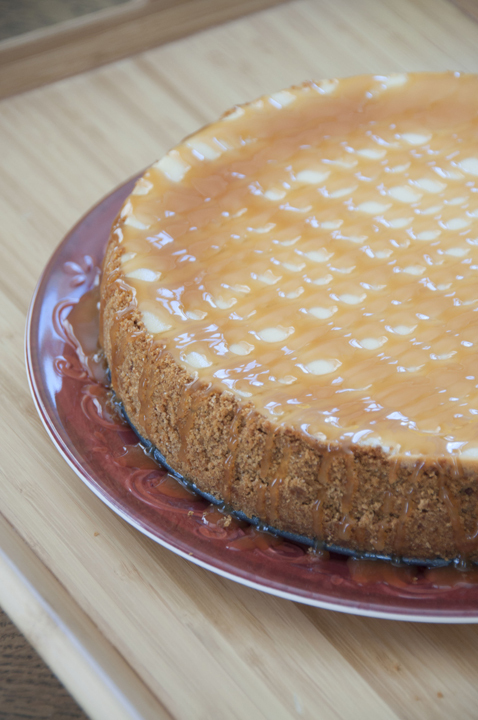 So, naturally, I had to try making a caramel macchiato cheesecake! My waistline was saying “noooooooooo” while my mouth was saying “yessssssssss”. Since this cheesecake is probably about 5,625,721 total calories, I made sure to have a cheesecake party on our patio and invited a bunch of friends over to get fat along with me. It pretty much disappeared immediately. Let me tell you, this cheesecake got SO many compliments! The most probably came out of my own mouth (I’m so vain!) but everyone truly loved it and couldn’t stop eating it. It just truly was the best cheesecake I can ever remember eating. Ever! Get. In. My. Belly. 1. Make sure ALL of your ingredients are room temperature. Leave them on the counter for at least an hour before making your cheesecake – this ensures everything will blend together without lumps. 2. Bake it in a water bath. This is simple to do! I talk about this in the instructions below, but you need to be sure to wrap your pan in foil so no water gets in, and you need a large roasting pan or a taller baking sheet to place the cheesecake in. This helps the cheesecake cook evenly, stay moist, and there will be less chance of cracks. Since when it comes to cheesecake the flavor combinations are endless, be sure to check out all of the other creative cheesecakes from my blogging friends – the links are below! 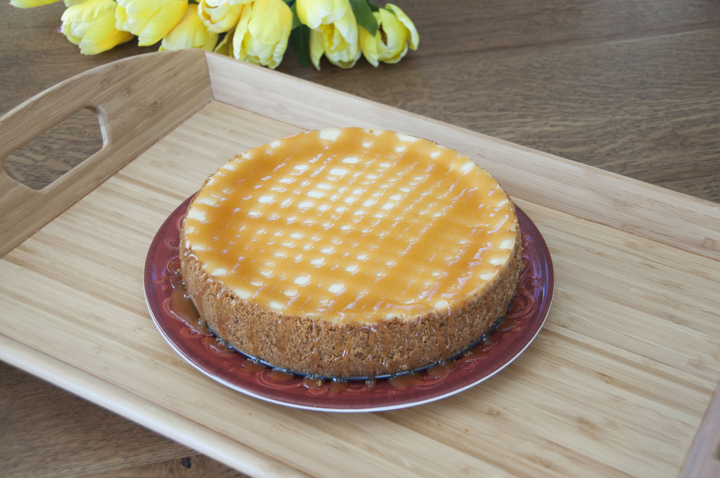 This decadent Caramel Macchiato Cheesecake is a treat you don’t want to miss! A caramel macchiato drink turned into the best cheesecake ever. *measure this exactly so your crust doesn't come out too crumbly or too wet. Preheat oven to 350 degrees F (175 degrees C). Lightly coat a 9-inch springform pan with nonstick cooking spray. Mix together the graham cracker crumbs, cinnamon, melted butter, and 2 tablespoons of sugar until well combined. Press into the bottom of the prepared springform pan, and 1 inch up the sides. Bake in preheated oven for 8 minutes, then remove to cool on a wire rack. Beat the softened cream cheese in a large bowl with an electric mixer until fluffy. Gradually add 1 cup of sugar, beating until blended. Add eggs one at a time, beating well after each addition. Stir in sour cream, espresso and vanilla. Pour batter into the baked and cooled crust. Wrap the bottom of springform pan in two layers of heavy duty aluminum foil. You will be baking your cheesecake in the water bath and you want to make sure no water gets into the pan from the seam at the bottom. Bake cheesecake in the preheated oven for 1 hour and 5 minutes; then turn the oven off, partially open the door and allow the cheesecake to rest for 15 minutes more (moving a just baked cheesecake can cause cracking). Remove from the oven, and run a knife around the edges. Cool cheesecake on a wire rack to room temperature, then cover the springform pan with plastic wrap, and chill in the refrigerator for at least 8 hours. Pour caramel sauce over the top (however you want to - I did lines across going in both directions). To serve, cut the cheesecake into wedges and serve. You can add more caramel sauce or whipped cream to individual pieces, if desired. Next Post » Back to School $400 Giveaway! WOW! I could have not believed this is your second time making a cheesecake! It turned out amazing Ashley! And the caramel drizzle, oh my! Cheesecake Day?! I can definitely get on board with that… especially for this delicious one! Graham cracker crust and caramel? YES PLEASE! Sounds spectacular! My sister always buys Caramel Macchiatoes from Starbucks, so I’ll have to make this for her! Ashley – this is GORGEOUS! I’ve yet to make a real cheesey cheesecake – most of mine are fake -with navy beans and cashews – your caramel macchiato one is making me wish lactose and I were good friends! Cheesecake based on my favorite drink – LOVE it! Cheesecake Day really is the best day ever! I love the stuff. So I’d love this — really nice take on cheesecake. Thanks. I am swooning! I love cheesecake, but I like caramel EVEN more!!! Your pics look fantastic and anything with coffee is a favorite of mine! I want to marry this cheesecake. Yay for national cheesecake day! I’m so glad I participated because I get to meet incredible bloggers like you, Ashley. You’re hilarious! I loved every word of this post and of COURSE I’m drooling all over myself at the sight of your perfect, luscious, creamy, caramel-y cheesecake. This is only your second time making it?! You could’ve fooled me. I LOVE that you used the caramel macchiato as your inspiration. This looks divine! Oh my goodness, this cheesecake! Ashley, this cheesecake looks absolutely amazing! And it’s my favorite coffee flavor! I’m loving all these incredible cheesecakes! This one os amazing, my favorite coffee, made in a cheesecake, love it! O.M.G.! This looks amazing! I love caramel macchiatos, but combining that with cheesecake?!? I need to try this! This is exquisite. Excellent cheesecake!!! Gorgeous photos. I cant get enough of these cheesecake recipes. I dig the caramel! my cheesecakes never turn out well wither, but this looks just perfect! STOP! I can’t believe this is only your SECOND cheesecake!! It looks amazing and that caramel macchiato combination looks to die for!! I’d say you knocked it out of the park for your second cheesecake ever. Gorgeous! Totally the best day ever!! You had me at caramel! Yummm!!! I’m going to need a slice of this stat! Delicious…I am in cheesecake heaven! Coffee in my cheesecake! Heck yes! Your cheesecake looks like it was made by a professional, and it’s only your second? I think I’ve made one once, but I do make mini cheesecakes because yeah, there’s a bazillion calories in those things! Great idea having a party to polish it off…I’m sure you had plenty of takers. haha Pinning! I became obsessedddd with caramel macchiatos in college! haha I still like them but I had a few too many back then 🙂 Love the sound of this cheesecake! My favorite coffee in a cheesecake – say it isn’t so! So making this! 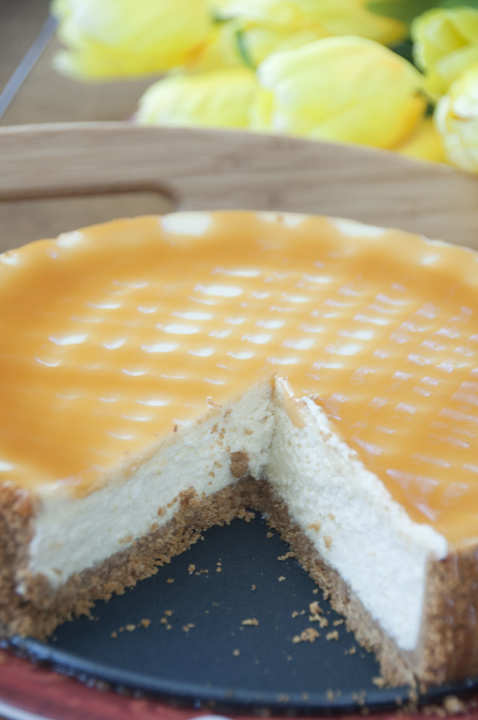 I love Caramel Macchiatos so I KNOW that I’ll love this Caramel Macchiato Cheesecake!!! This is only your second cheesecake?! Wow, well, it’s a beauty!!! love the caramel sauce on top. . totally pinned and can’t wait to try! Well hello there gorgeous! What a great looking cheesecake. 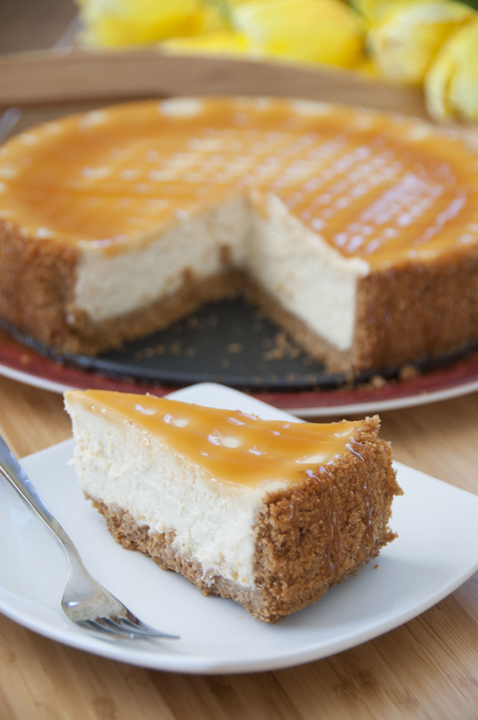 This is an AWESOME second cheesecake–coffee and caramel are my favorite! I can see why you love this recipe so much. So glad to be celebrating cheesecake day with you! definitely craving a slice right now.. that caramel topping looks AWESOME! You are just a genius incorporating the one of best espresso drinks ever into a cheesecake. Yum times a trillion! This is so gorgeous – I never would have guessed it was only your second cheesecake.You’re a pro! I love that you turned my favorite Starbucks drink into an awesome looking cheesecake!!! it is absolutely gorgeous looking! Sign.ME.Up!! i love this beverage and love that you made it into cheesecake form. Total win! Just reading the name of this gorgeous cheesecake with a twist makes my mouth water! Awww thanks, Daniela! It’s amazing! This looks great, especially since it’s only your second cheesecake. I bet you are going to be making some more often now. I love the caramel topping and the coffee flavor inside the cake – on my “to make” list now. 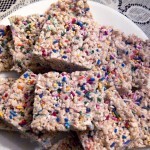 Hi there….I see that this is an exact copy of a recipe on all recipes.com posted by a user named Dawn. However, she posted this in 2006….if this is where you found the recipe, I think she would appreciate credit? Yes – if you look under “recipe source” I credited where I got the recipe from 🙂 I always credit the source of the recipe when I know of it. Thanks! This is my favorite cheesecake. I have made it several times. It makes me sad however. My recipe comes from allrecipes.com. and is not yours . It is however identical to that one with one change, you added cinnamon to the crust. Her recipe has been on the web much longer. Perhaps you should give her credit? Just saying. Merry Christmas Tammy! 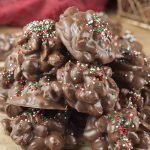 If you read the whole post, you would see that I credited allrecipes.com at the bottom of the post. I never steal recipes and I certainly ALWAYS give credit where credit is due. That’s how I roll 🙂 Thank you for your concern, though. I really appreciate the comment and hope you’re having a great Christmas Eve! Caramel cheesecake i love to eat and also your guidance about how can I make really very helpful for me.